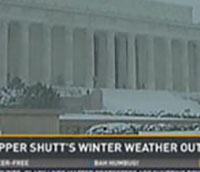 D.C. News Crews Go Above and Beyond | Broadcast Public Service: Local Stations. Big Impact. In addition to providing round-the-clock coverage, Tegna’s CBS affiliate WUSA crews helped Montgomery County, Md., residents dig out from under the snow. Watch video. "It is absolutely ALL HANDS ON DECK here and the round the clock coverage has been underway online all week! I personally have brought a cot to the weather center just in case I don’t care to leave, but we have hotel rooms ready just up the street!" said Fox-owned WTTG Weather Anchor Susan Palka. Broadcasting & Cable and TVSpy featured articles on the temendous storm coverage broadcasters provided.